Are you lazy like me, Want to get food at low cost. As low as 50% Off each time you buy? Yes, on Swiggy 50 % OFF For First Five Order? If yes go through the Article and Follow the Steps. Everyone, Now a Days Use List Food Delivery App to get the Food Delivered. It is easy to orders the Food and Off Course a lot of effort for making the food as the Peoples in the metropolitan cities are generally working at Big MNCs. They don’t even have time to eat the food and in such situation, it is impossible for them to cook the own food and try cooking skill. At that Place, the Role of this Food Delivery App Comes in Account. The Main targeted customer of this app is these People who don’t have time to cook at the same time they have a lot of money to buy/ order the food. But there are some people like us who have so lazy to do work and so tired of cooking food of our own. And As we are tired and lazy to do work, We also don’t have money for the reason. But we Lazy people are so Brilliant and we are expert, we get our work done in any condition. So for those Lazy people, this is the simple trick where you can get the Food At low Cost. We all are searching for offers and as there is a huge competition is going on in the market there are a lot of offers campaign also going side by side. The Only thing we have to do is searching for that Golden Offer For getting food, at last, we are living for Food only. If you have the App please, Go to setting and App setting and Clear all App Data. After that Create A Account on Amazon and on Swiggy with the same credential. Buy Something that Wroth 200 Rs, Anything you want to eat. At the Time Of Payment, Apply Coupon Code ORDER50 Check properly before processing further. And Make a Payment of 200 Rs with Amazon Pay. After the delivery comes to you will get the 100 Rs back, it takes some time. 5. Rest 100 pay via Amazon pay, u will get instant 100 CB in Amazon. Enjoy you are now done everything. 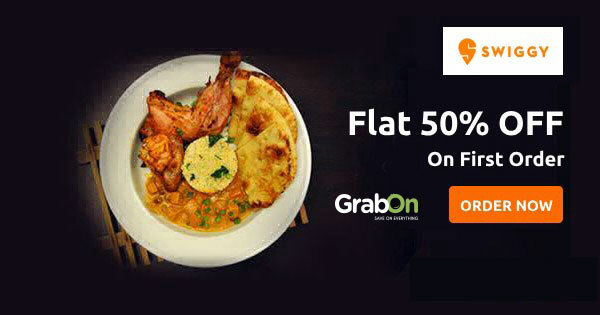 Now Onward you can get the 4 Order to 50% Off but up to 100Rs. And If are really a lazy Brilliant Person and love Food as much as I love a Food freak then you know how to get all your order at 50%. After 5 Order also. Stay Tune and Please Subscribe our blog and E-mail Box for such Offer directly in Your Mail Box and Enjoy. New Offer is coming Soon…..